The programme of tours and trips for 2017 is shown below. Saturday 28th January 2017 - Winter Social at Dover. 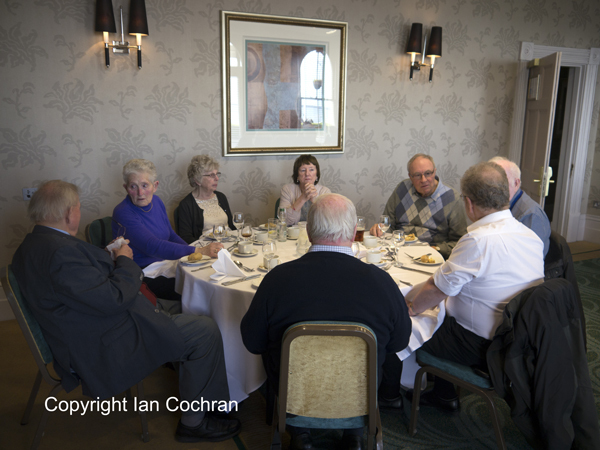 Around 38 members met at the Dover Marina Hotel on the last Saturday of January for our regular Winter Social get together. 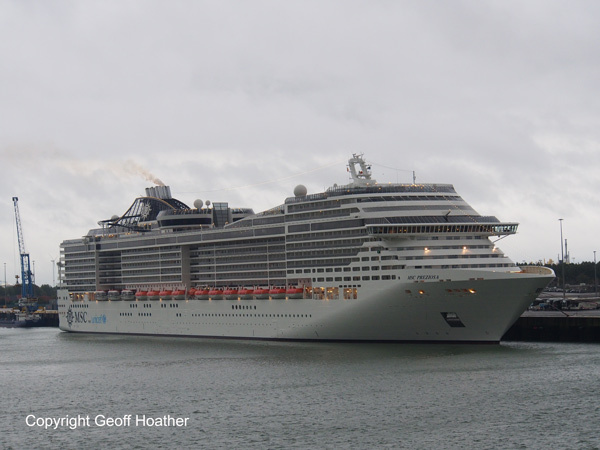 There were no travel problems reported except for the usual traffic in Dover town centre and even weather was kind with good visibility across the channel giving excellent views of passing shipping and the ferry movements in an out of port. The rain managed to hold off until Sunday afternoon. 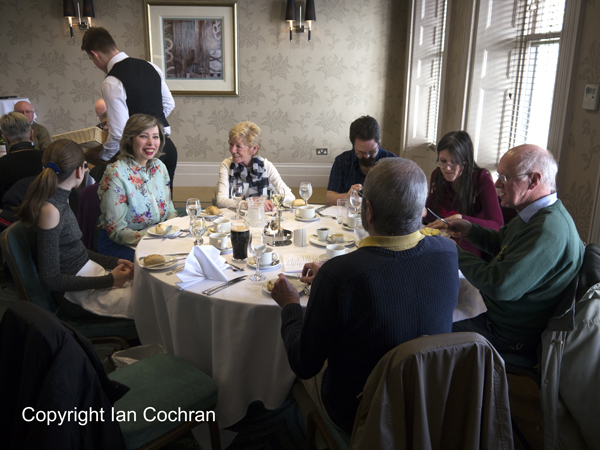 The day took on its usual format with pre-lunch drinks, teas and/or coffees, before sitting down in the Chartwell Suite for the lunch, which was up to its normal very high standard. 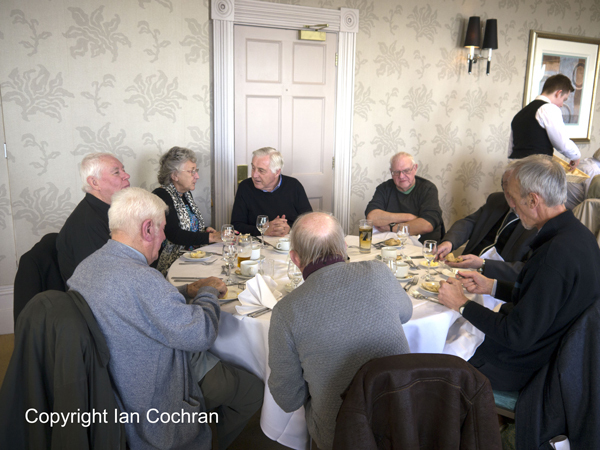 Following lunch, the tables were cleared back and the chairs re-arranged to enable everyone to enjoy the slide show, which was given by WSS Southampton branch member, Mick Lindsay. The slides covered several decades and many areas of the world, including the St Lawrence, New York and places closer to home. Mick showed a good selection of vintage cruise ships, cargo liners and tankers, among others. Giving a different perspective on ship photo collections, most of the slides were purchased on e-bay or at car boot sales proving that with a little research you can pick up gems, such as the ‘Andrea Doria’ entering New York on her maiden voyage in 1954. For those staying over on Saturday night, the reefer ‘Luzon Strait’ was seen entering Dover Harbour at breakfast time on Sunday and the morning dawned clear and sunny for those using AIS in their bedrooms and elsewhere to note the passing traffic. 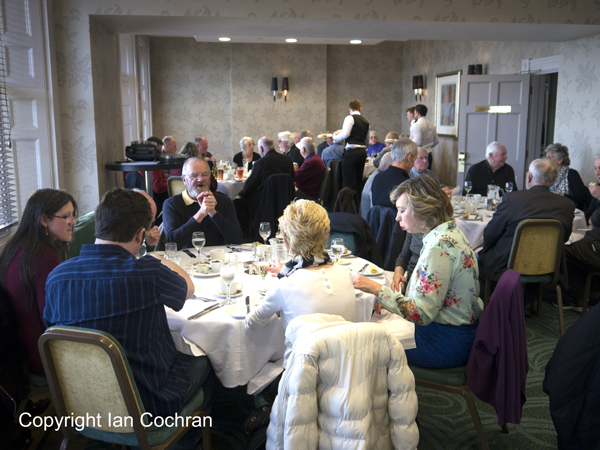 Once again, our thanks go to Roger Hammond for organising the day, Mick for the slide show and to the staff of the Dover Marina Hotel who looked after us very well once again. Due to its popularity, the committee has provisionally booked the venue again for Saturday 27th, January, 2018 at which, we will hopefully show photographs taken from our forthcoming trip to the Panama Canal. Members will be informed as soon as the details have been ironed out via a circular due to be issued later this year. 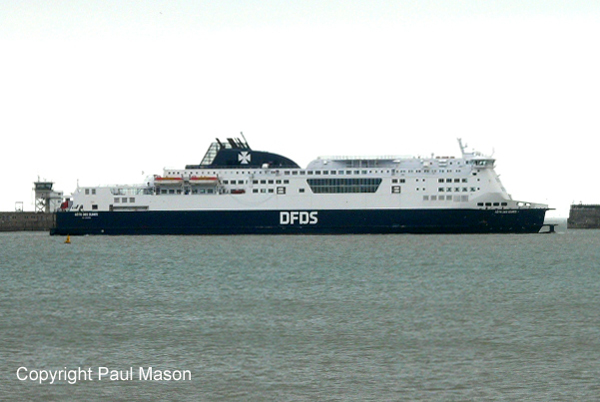 Ferry COTES DES DUNES at Dover. Photos by Ian Cochran and Paul Mason. 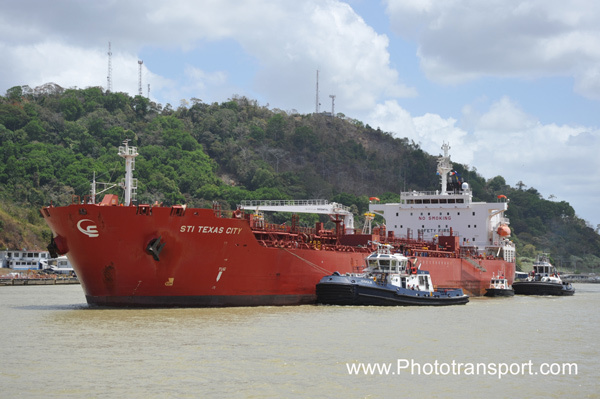 STI TEXAS CITY departing Miraflores Lock on a northbound transit. MG SAKURA near Gamboa onwards to Miraflores. STENA CLEAR SKY approaching Gamboa Southbound for Miraflores Lock. CLIPPER POSH waiting in Gatun Lake preparing for onward transit through lock system. 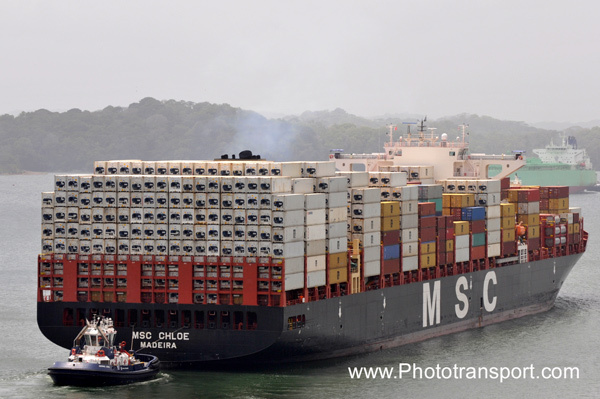 MSC CHLOE well laden with containers departing from Gatun Lock. PRETTY SIGHT waitiing in Gatun Lake to enter the locks. ISLAND PRINCESS coming ito Miraflores Lock southbound towards the Pacific. BREEZE making way slowly to Gatun Locks for onward transit to the Atlantic. 28 TSS members participated in the first long haul trip the TSS has undertaken for some time. 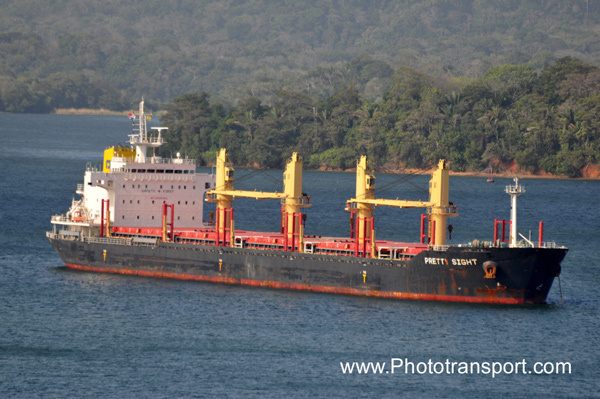 This was to Panama and the Panama Canal to view the shipping transiting this major waterway. Over 250 ships were noted during the duration of the trip all being ocean traders with no coastal shipping noticed as we are used to in Europe. The main shipping highlights were as follows. The Full Panama Canal Cruise taking 12 hours from the Pacific Ocean end of the canal to the port of Colon on the Atlantic side of the canal. 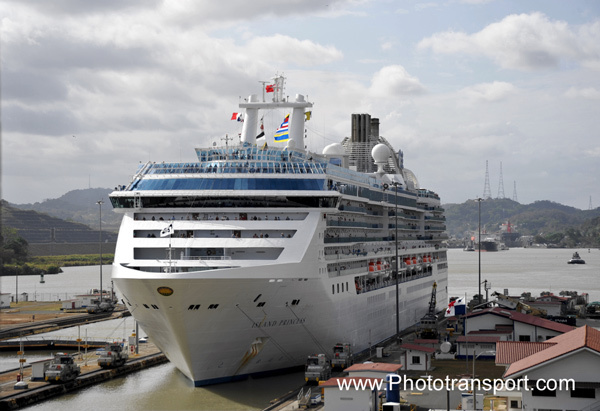 This included locking in and passing through the Miraflores and San Pedro locks to raise the cruise vessel up 90ft to the main canal passing through the Gatun Cut and through the lakes and forest. We were in the locks with the tanker STI TEXACO CITY which delayed us somewhat but it was interesting to note how the vessel was “controlled“ by the mules which do the rope handling through the locks. Once through the San Pedro locks we met a series of ships Pacific bound which included the bulkers TOMORROW, LUSITANIA G, MG SAKURA, ULTA LETIZIA and OCEAN GOLD. 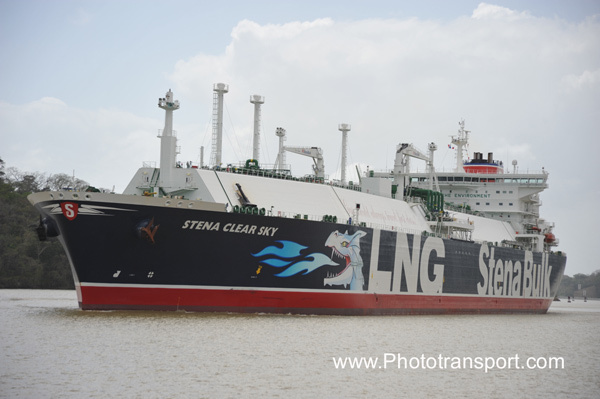 Three large LNG carriers were also noted these including STENA CLEAR SKY, BW TUCAN and CLIPPER POSH. Two visits were made to the visitor centres at the Miraflores Locks and the Aqua Clara visitor centre which overlooks the new Gatun Locks at the Atlantic end of the canal. This new facility offers excellent views of ships going through both sets of locks and anchored awaiting transit through the locks. The views over the new locks which take ships up to 150,000 tonnes was also very good. Large ships seen transiting these locks included LPG tankers PACIFIC WEI HAI, and GAS SUMMIT and the new generation container vessels MSC CHLOE and CALLAO EXPRESS. 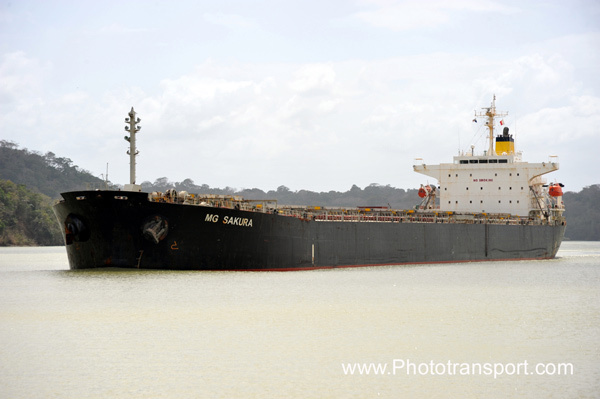 Other vessels noted included the bulkers DAXIA, UBC SEATTLE, CONDOR and PRETTY SIGHT. The USA Military sealift command vessel LT JOHN P BOBO was also noted. The Miraflores visitor centre by contrast offered relatively poor photo opportunities of ship moving through the locks but very close up views of the old locks and non-existent views of the new locks. Ships watched passing through the old locks included bulkers ABBYSINIAN and RESKO and the cruise ships STAR BREEZE, AZAMARA QUEST and ISLAND PRINCESS. The 3 hour cruise on a catamaran round the Pacific anchorages proved to be a highlight of the trip with over 30 ships noted in excellent photographic conditions. Bulkers included JING LUI HAI, LANNA NAREE, CLIPPER TRITON and PUERTO ROSARIO. Reefers included BALTIC COVER, BALTIC MERMAID, SANTA MARIA and the elderly ORION S. Tankers included RIOJA KNUTSEN, B W ARIES and SCF PROGRESS. These trips were supported by a Panama City tour, a journey from Colon to Panama City on the canal railway and a rain forest trip. The hotel was situated by the canal and offered reasonable views of passing ships although trees got in the way and light for much of the day was in the wrong place. Nevertheless this is the only canal side hotel and was a great place to be based right alongside the canal at the Pacific end of the waterway. Altogether a superb trip which was enjoyed by all. Saturday 1st April 2017 - AGM and Southampton Cruise. The AGM was held on the Ocean Scene but we had to transfer to the Wight Scene for the harbour tour. This might be the last time at Ocean Village for us as the Ocean Scene must find a new berth. After a marvellous meal and the AGM we left Ocean Village about 1415. As we came out of the dock the HAMBURG EXPRESS 12/142295 passed Dock Head outward bound for Singapore. At Dock Head we saw five tugs on the berth. 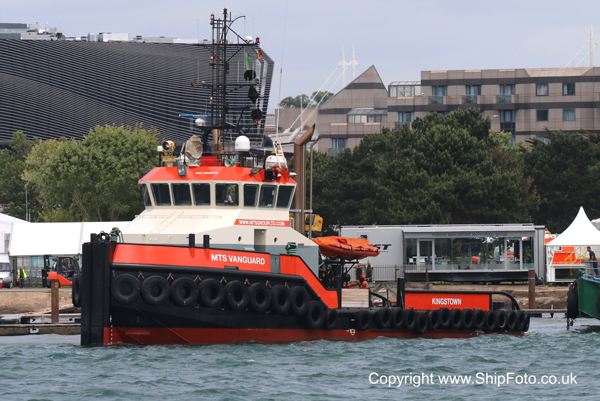 Another fleet of tugs, this time Kotug Smit, has come to Southampton as reported in Trippers Times. SMIT TIGER 09/484 and SD SHARK 08/486 were at berth 48 the SD SALVOR 10/490 and ZP BOXER 12/299 at berth 104W. 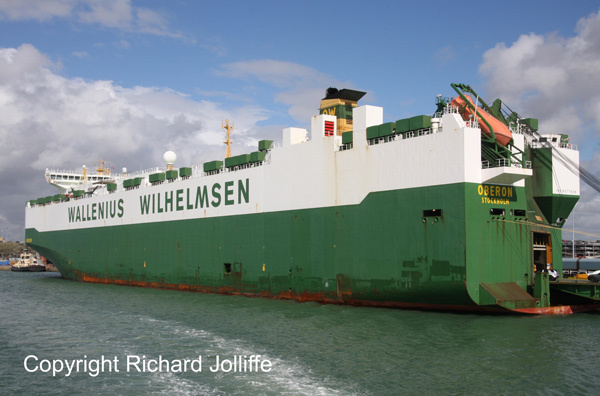 The Wallenius Car Carrier OBERON 08/71673 was at berth 44 having arrived earlier from Zeebrugge. At 105 berth was the regular visitor AUTOSTAR 00/20010. 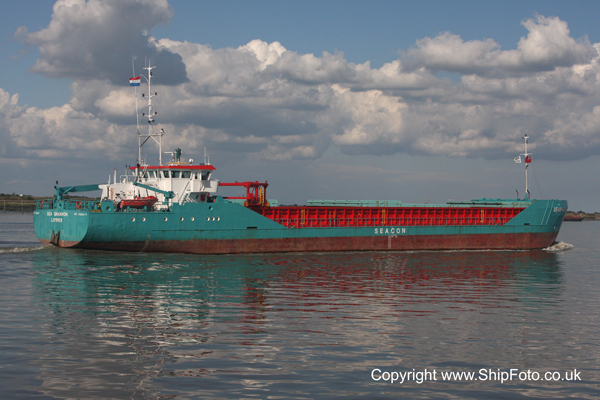 The Dutch coaster PASSAAT 94/1937 on its fourth name was at 107 berth and the bulker FLORENTIA 16/36421 at 108/9. Florentia had recently hit the quay coming out of the KGV dock and suffered a hole requiring urgent repairs. The ship sailed for Iskenderun on the 2nd. We were very lucky to see the KRISTIINA 99/4893 sailing without tugs from the KGV dock for Oxelosund. She had arrived from Tilbury. At the Container berths only the regular feeder LISA 03/7519 was alongside at SCT4E. The Poole tug HANDFAST 84/79 with barge JML 50 loaded with rocks was working between Marchwood and the container port. Near Fawley the Kristiina pulled away from us and the UKD BLUEFIN 97/4171 came inward bound to work off Fawley. 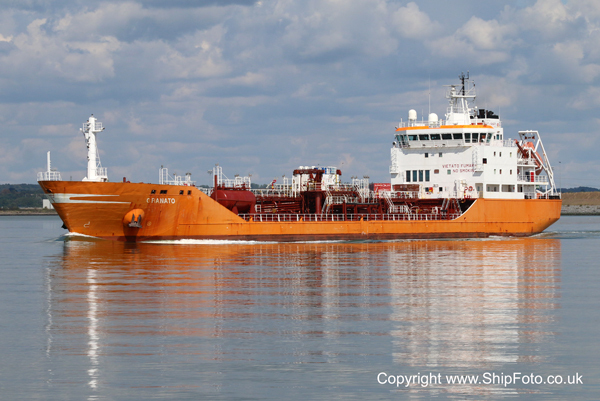 Fawley seemed rather quiet with the MOSCOW UNIVERSITY 99/56076 on berth 5 and the LPG tanker MATHRAKI 03/18315 on Esso 1. UKD SEALION 03/224 was working near the berths. The smaller tanker ATLANTIS ANTIBES 09/4028 was on the other side at berth 9. Then something very unusual happened. 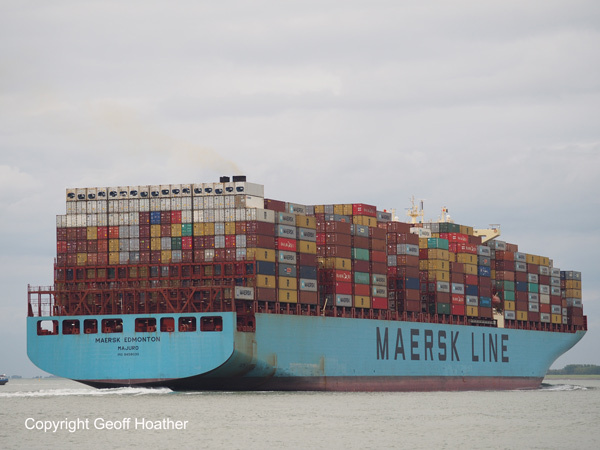 The Captain of the Wight Scene knew the Pilot on the incoming container ship MAERSK ENFIELD 11/141649 and also the Captain on the harbour launch Spitfire. The Pilot came on the bridge wing to wave to the Wight Scene. A few seconds later the Spitfire came right alongside the Wight Scene requesting cups of tea for his crew for letting us get so close. The transfer was completed safely in a couple of minutes then the Spitfire rushed away. But did they ever get their cups back I wonder? We then turned back towards Southampton following Maersk Enfield on the Hamble side. We then turned into the Empress dock where there were the usual number of small craft and bunkering tankers WHITCHAMPION 03/2965, JAYNEE W 96/1689 and WHITONIA 07/4292. Amongst the smaller vessels were the AFON GOCH 97/123 and LLANDWYN ISLAND 94/113. Strangely the Llandwyn Island has not appeared on the ABP docks lists whereas the Afon Goch has. SVITZER SARAH 91/364 remained laid up. The Jersey Pilot Boat Rival was alongside the Oceanographic Quay. As we returned to dock two ships sailed down the Itchen. The first was an Inverness registered ALYSSA. It is newly built by Southampton Marine Services at its Ocean Quay shipyard in Southampton. It is an aquaculture service vessel built for Scottish commercial diving and marine services company Leco Marine. Finally the CITY OF CHICHESTER 97/2074 came under the bridge heading for Shoreham. And so ended an excellent day involving two Blue Funnel ships. Thanks to the crews for an interesting day. OBERON in the Eastern Docks. FLORENTIA in the Western Docks. KRISTIINA departing from KGV dock. MATHRAKI at Esso berth 1. MOSCOW UNIVERSITY at Esso berth 5. 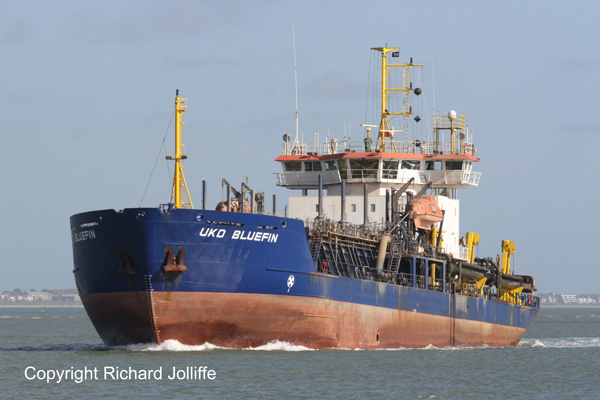 UKD BLUEFIN was also inward bound. Supplying tea for the crew of the Spitfire! 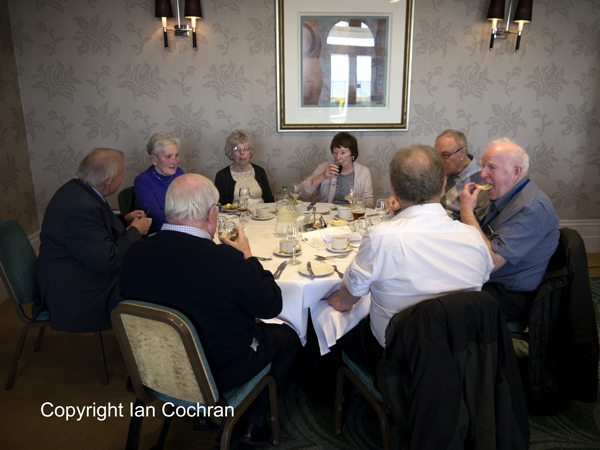 We had a table at the South West Ship Show at Portishead with committee members on hand at this popular Ship Show. Unfortunately this cruise has been re-scheduled to 19th August due to the unavailability of the Princess Pocahontas. Our first Solent Cruise of the year took place on Saturday 10th June. The weather was dry with periods of sunshine as we departed from Ocean Village at noon on board Blue Funnel’s Ocean Scene. First we explored Southampton Docks. The Eastern Docks were busy with the usual array of vehicle carriers including Morning Lena, Hoegh Target and Baltimore Highway. 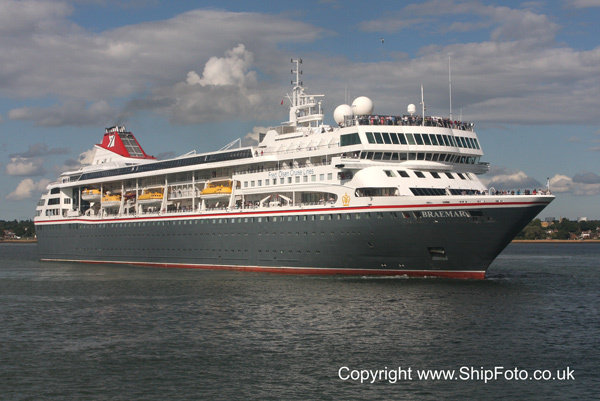 Fred Olsen’s cruise ship Braemar was at 38/39 berth. Mayflower Park was a hive of activity with preparations underway for the Seawork Exhibition, featuring various workboats, tugs and other vessels. The tug MTS Vanguard had just arrived with the large jack-up platform Skylift 3000 from Rotterdam. 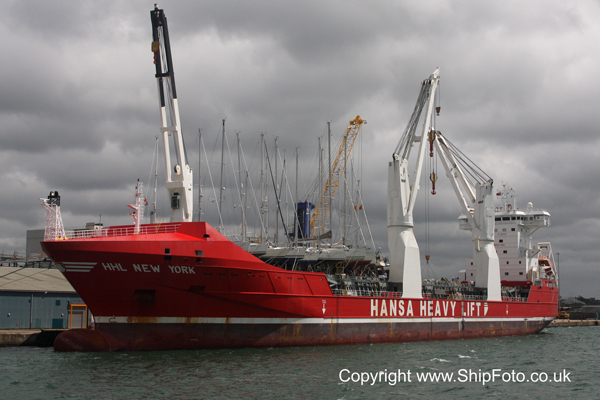 In the Western Docks the heavy lift ship HHL New York was busy loading yachts. 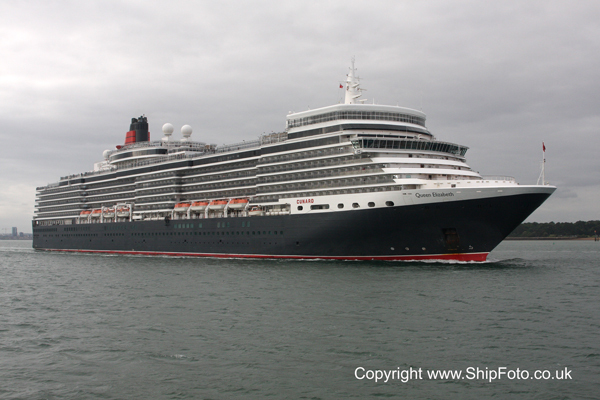 Cunard’s Queen Elizabeth was at 106 berth preparing for her next cruise. The vehicle carrier Viking Odessa passed us outbound, for Santander. 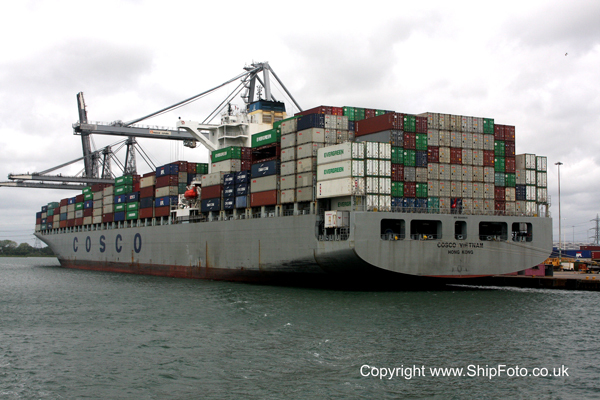 The container terminal was a little quiet with just the Cosco Vietnam present. We then made our way down Southampton Water and past the tankers at Fawley and across the North Channel in the Solent bound for Portsmouth. 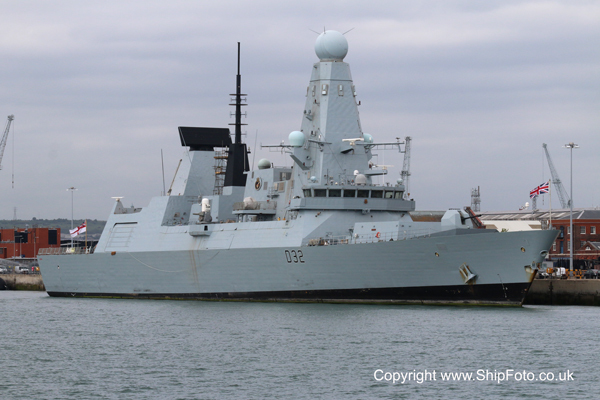 The Naval Dockyard at Portsmouth was populated with the Type 45 destroyer HMS Daring, the now retired RFA oiler Gold Rover and the SD Victoria amongst others. 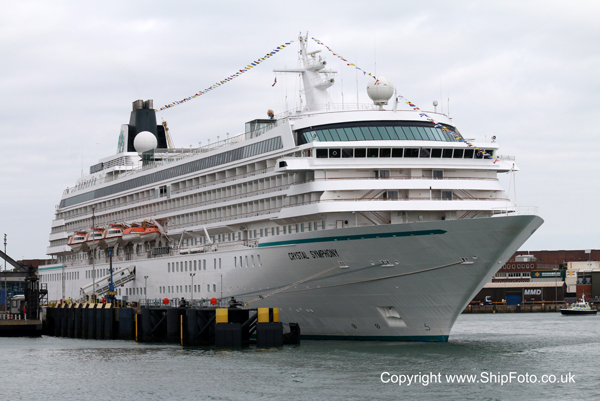 At the commercial port was the large cruise ship Crystal Symphony. Back now to Southampton. We just managed to get back past Calshot on the “sunny side”, though there wasn’t a lot of sun by this time, for the departing cruise ships. Braemar was the first one out bound for Bordeaux. She was followed by the Queen Elizabeth whose first stop was Hamburg. As we made our way back to Ocean Village we just had time to photograph the coaster Sylvia outward bound from the KGV Dock for Oxelosund, though by this time we had crossed to the wrong side for the sun. Our thanks as usual to Simon Martin and other TSS Committee members for organizing the day and to the captain and crew of the Ocean Scene for their hospitality. MTS VANGUARD off Mayflower Park. HHL NEW YORK loading yachts in the Western Docks. COSCO VIETNAM in the container terminal. HMS DARING in Portsmouth Harbour. CRYSTAL SYMPHONY at Portsmouth Cruise Terminal. ...followed by the QUEEN ELIZABETH. HAI YANG SHI YOU 720 in Waalhaven. 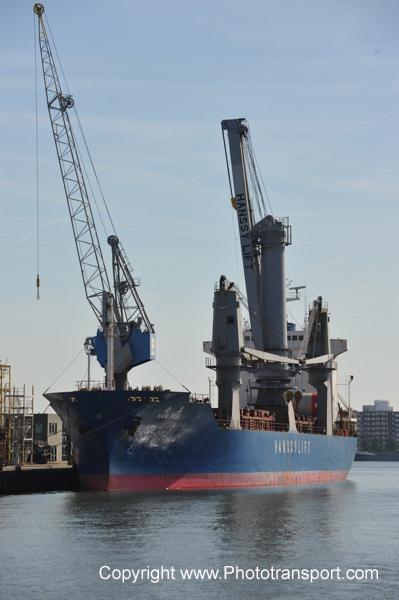 Heavy lift vessel HAN HUI in Waalhaven. FSPO PETROJARL 1 in Wiltonhaven. 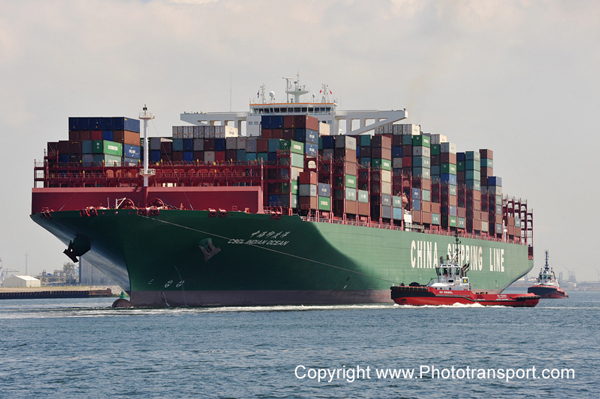 CSCL INDIAN OCEAN departing from the Euromax Terminal. Triple-E MUNKEBO MAERSK at Maasvlakte 2. ANANGEL HOPE at the mineral berths on the Caland Canal. NAVE QUASAR and NS CAPTAIN in the Caland Canal. Photos by Ian Cochran and Dave Smith. Sunday 18th June 2017 - Rotterdam and Europoort Cruise on Partyschip Diane. Nearly 50 members assembled at Vlaardingen for the usual 9am departure in almost tropical conditions. Due to a flood tide, this year’s 11-hour Partyschip Diane cruise around Rotterdam and Europoort/Maasvlakte started by visiting the upriver berths. We sailed as far as the Parkkade, via the Eemhaven and Waalhaven complexes. 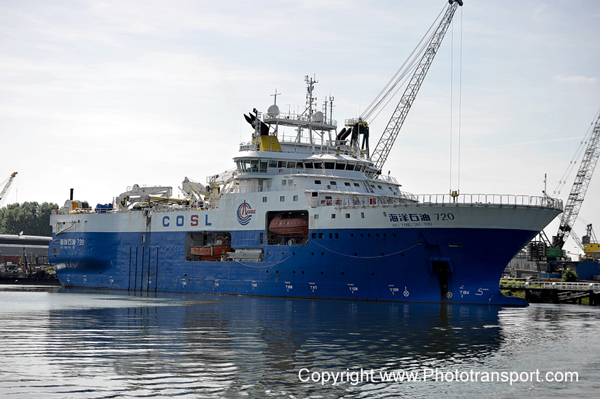 One of the highlights in the Waalhaven was the Chinese research vessel Hai Yang Shi You 720 and the Hong Kong flagged heavy lift ship Han Hui, which for those staying at the Delta Hotel provided photo opportunities when sailing down the Nieuwe Waterweg that evening. On the way back down river, we stopped at the Lekhaven and Wiltonhaven to keep the ‘tugnologists’ happy. 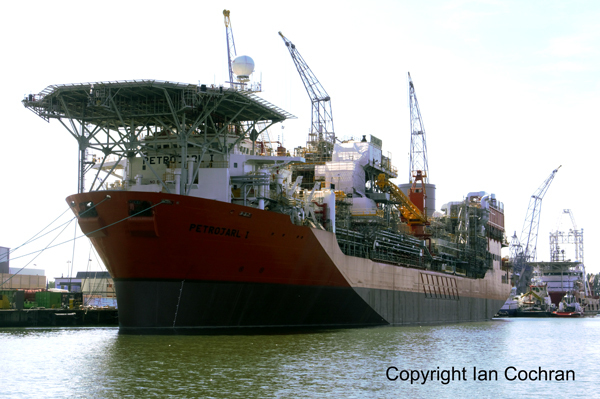 The FPSO Petrojarl 1 was lying in the latter. The river berths at Pernis and Vlaardingen were full of tankers, including the Histria Agata. The orange juice carrier Orange Star passed us inbound as did the large pipe-layer Seven Borealis. We proceeded down the Nieuwe Waterweg passing the inbound UASC containership Al Manamah on her way to the Waalhaven, plus a few other smaller vessels. 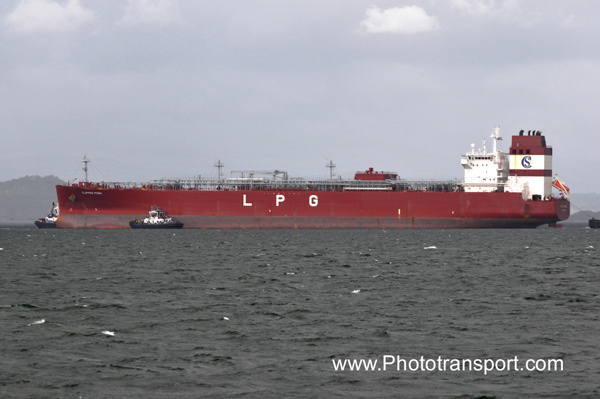 Upon entering the Europoort complex, the large tankers Venice and Zouvra were spotted at Maasvlakte (8th Petroleumhaven) while the CSCL Indian Ocean was being pulled away from the Euromax terminal. We continued up to Maasvlakte 2 where the Triple-E Munkebo Maersk was berthed. Re-tracing our steps we saw the Evelyn Maersk and the Kyoto Express at the Europahaven and Amazonehaven, respectively, plus the usual selection of feeders. 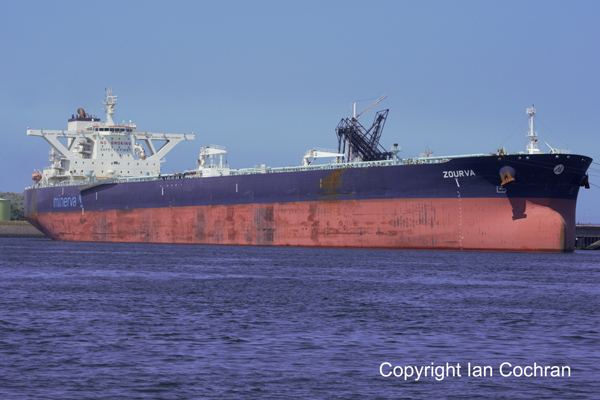 Somewhat unusually, the Mississippihaven was completely devoid of bulk carriers, but the large tankers Besiktas Bosphorus and the 2017-built British Restraint could be seen at the 6th Petroleumhaven. 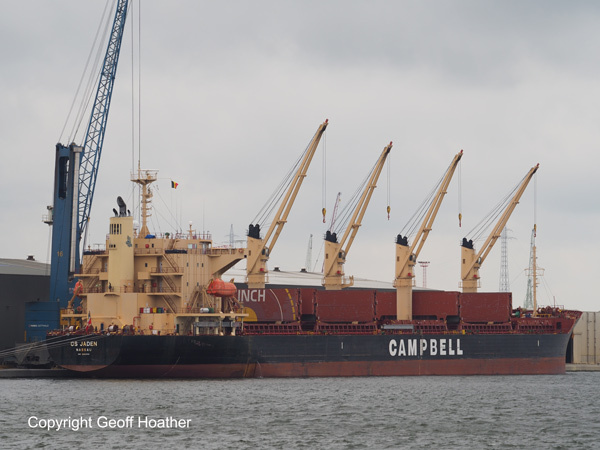 Turning back into the Caland Canal, both the mineral berths and the grain berths were almost full of bulk carriers, which included the Anangel Hope, Successor, Centaurus Dream on EECV and Inspiration, Lyric Harmony and Alpha Honesty discharging grain. 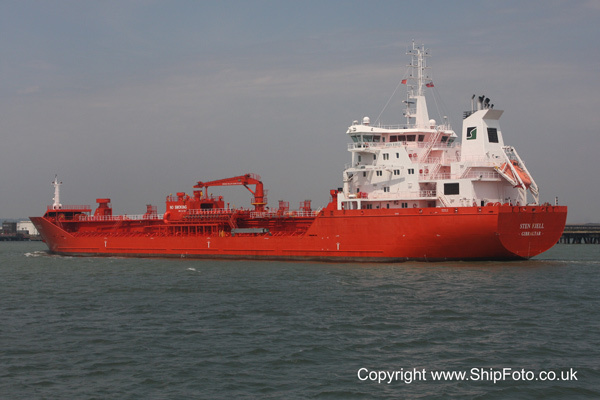 In the Caland Canal, we followed the inbound chemical tanker Baltico. 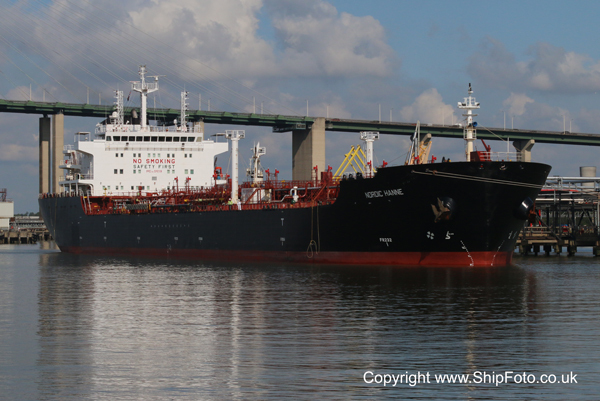 One of the highlights in the Canal was the VLCC Nave Quasar taking cargo from the NS Captain in a ship-to-ship transfer operation. There were also several tankers of all shapes and sizes in the 7th Petroleumhaven, including the VLCC Samail and the Suezmax Amazon. We continued passed the Brittaniehaven into the lock and headed towards Botlek along the Hartel Canal. There were several vessels in the Botlek complex, including P&O Ferries Pride of Bruges and the 2017-built Aframax Minerva Coralia at the shipyard. 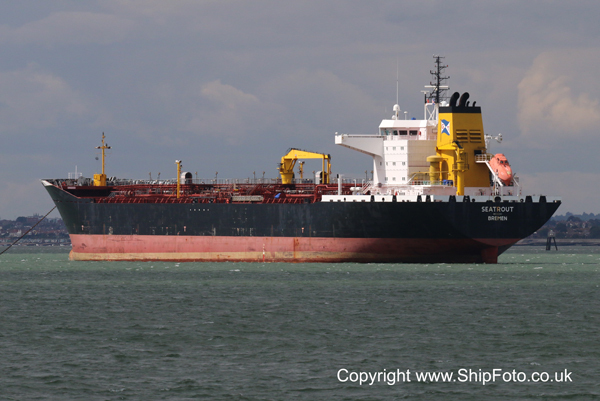 Finally, opposite Vlaardingen in the 1st Petroleumhaven was the tanker Navig8 Violette and following us up the canal was another tanker, Emma Victory, which also berthed in the 1st Petroleumhaven, thus ending another very enjoyable day with well over 100 ships seen. Our thanks go to the captain and crew of the Partyschip Diane for their excellent hospitality once again and the TSS committee for organising the day. We had a table at the Ocean Liner Society Ship Show at Southampton. For more information about the show please see the Ocean Liner Society website. Several committee members were in attendance. A warm and mainly sunny day greeted the TSS members who assembled at Gravesend for the midweek Thames and Medway cruise on board the Princess Pocahontas. Shortly after 11am we cast off and proceeded down river with Cobelfret’s Adeline just ahead of us. She was outbound from Ford’s at Dagenham. She slowly pulled away from us as she gained speed. 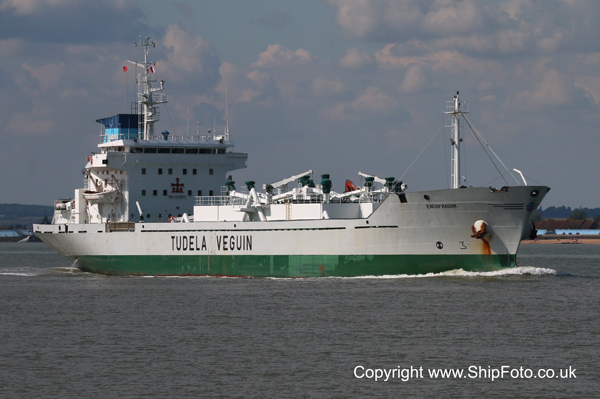 The first vessel inward bound was the Pengalia on her usual run in to Tilbury Dock from Hull. She was followed in by the dredger Sand Fulmar. 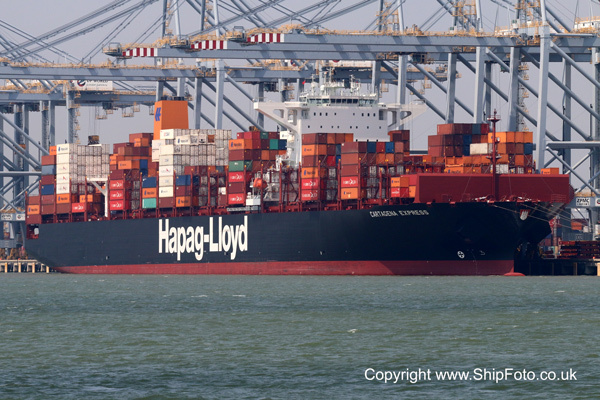 At London Gateway, the large Hapag-Lloyd containership Cartagena Express was berthed with the large tanker Pacific A. Dorodchi just ahead of her at Shellhaven. She had apparently brought in aviation fuel from Singapore. 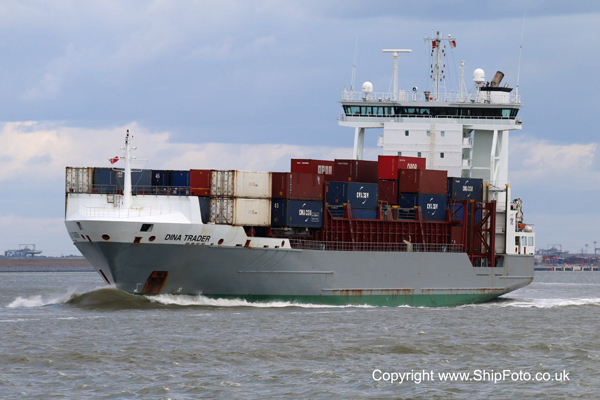 The feeder containership Henrike Schepers was the next to pass inward, closely followed by the Sten Fjell in for Grays Terminal. 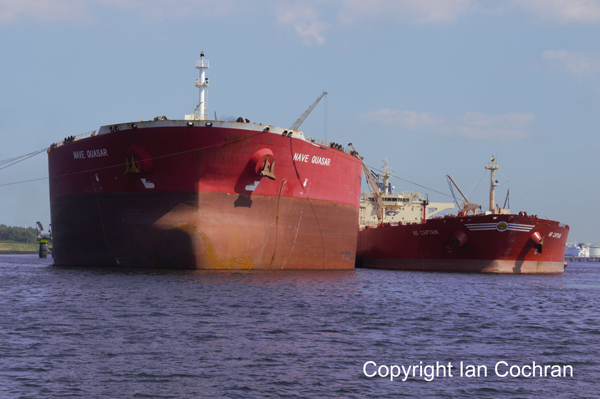 At the Oikos jetty, the tanker Seashark was being berthed by three of the Svitzer Tugs. 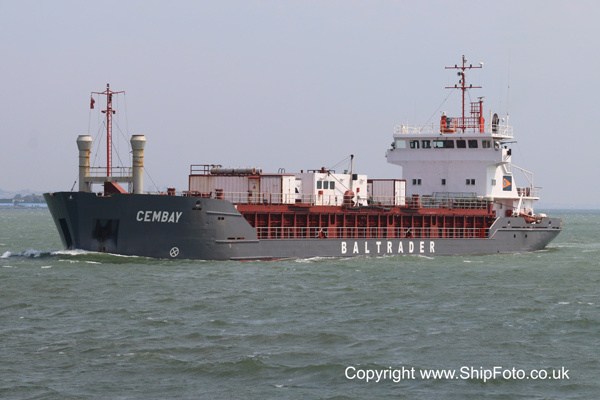 The next inbound vessel was the cement carrier Cembay bound for Tilbury Dock. 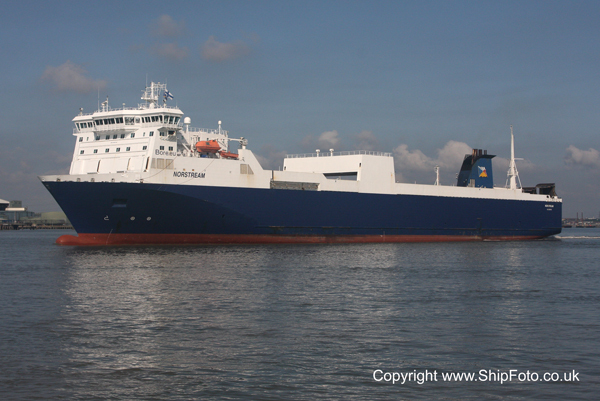 Finally the Cobelfret ro-ro Undine passed inward for Ford’s. As there were no vessels in the Southend Anchorage, we then proceeded to the Medway, slowing to allow the Navi Star to catch up with us. She was outbound from Tower Wharf. Just off the entrance to the Medway, the small bunkering tanker Conveyor was approaching the anchored coaster Butes. Into the Medway now, as far as Thamesport where the small feeder containership A2B Future was the only vessel present. 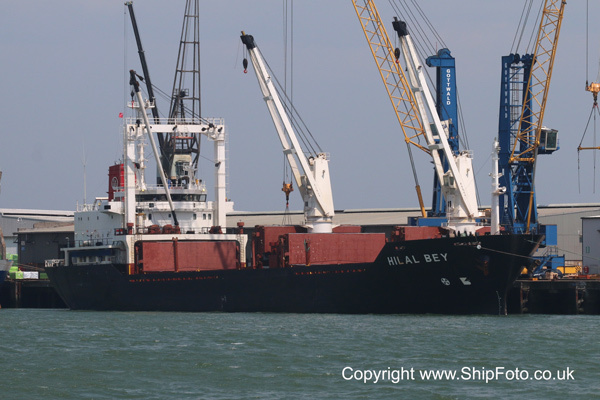 Sheerness was, however, fairly busy with the unusual sight of a Turkish owned general cargo ship Hilal Bey being the pick of the bunch. 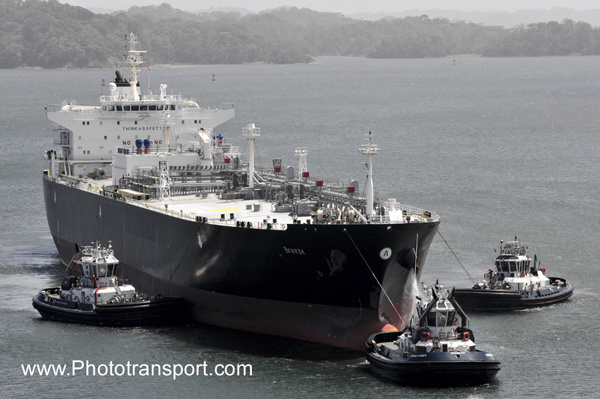 The vehicle carrier City of Amsterdam was being assisted to her berth by the tug Svitzer Victory. Also Wagenborg’s Oranjeborg was present. 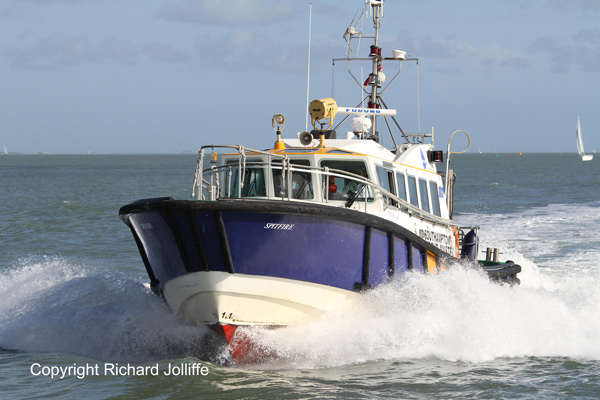 We then left the Medway, being overtaken by the speedy Sheerness pilot boat Estuary Warden, fighting against the swell at the mouth of the river. We then proceeded back up the Thames, past the Oikos, Shellhaven and London Gateway berths allowing close up views of the vessels there and also of the tugs moored in the vicinity. These included the new Svitzer tugs Svitzer Ganges and Svitzer Monarch. The small containership CMA CGM Goya passed outbound from Northfleet Hope for Rotterdam. We continued up the Thames past Tilbury and Northfleet Hope container terminal where the containerships Francop and Melchior Schulte were berthed. Further upstream the tanker Bro Nakskov was at the Vopak Jetty and the usual Cobelfret ro-ro vessels Valentine and Amandine were at Purfleet. At this point we turned around and made our way back to Gravesend, where the cruise ended. Our thanks to Dave Smith and members of the committee for organising the day and to Captain Potter and the crew of the Princess Pocahontas for looking after us so well on the day. Photos and report by Chris Brooks. ADELINE outbound at Gravesend Reach. 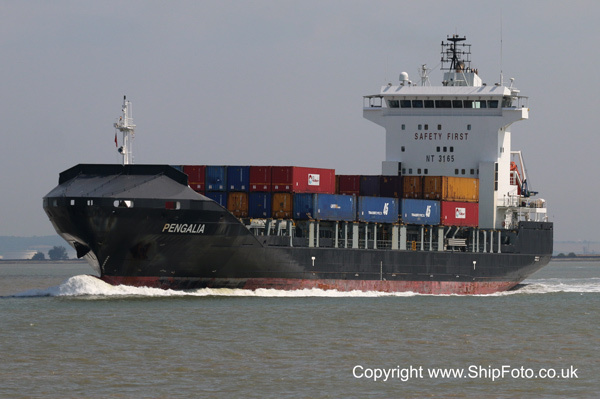 PENGALIA inbound for Tilbury Dock. 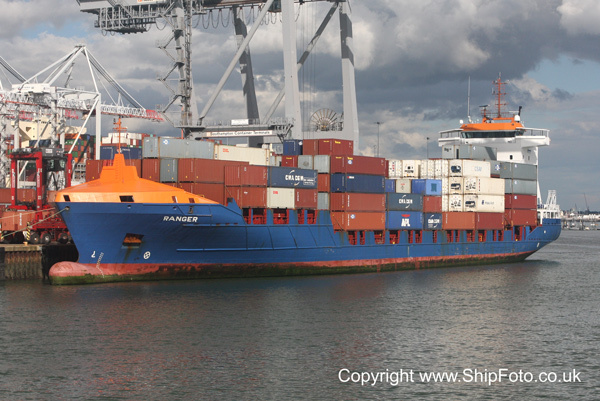 Hapag-Lloyd's CARTAGENA EXPRESS at London Gateway. 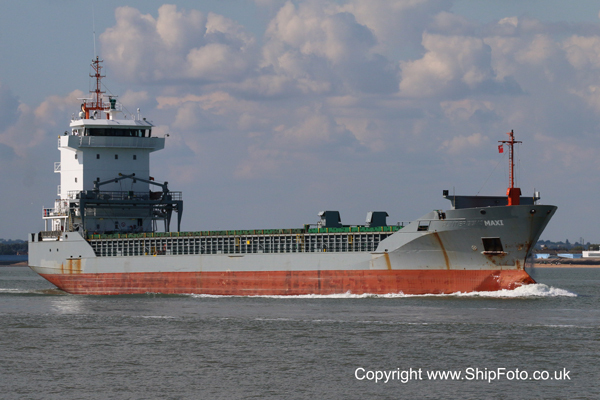 STEN FJELL inbound for Grays. 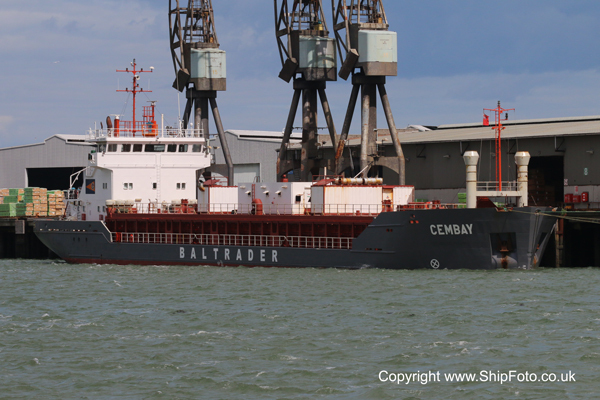 Cement carrier CEMBAY inbound for Tilbury Dock. 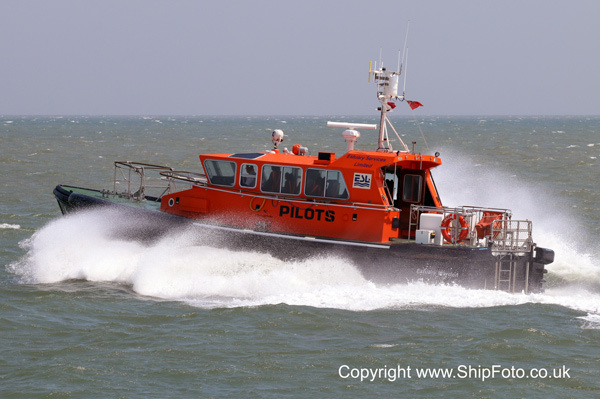 Pilot boat ESTUARY WARDEN outward bound from the Medway. 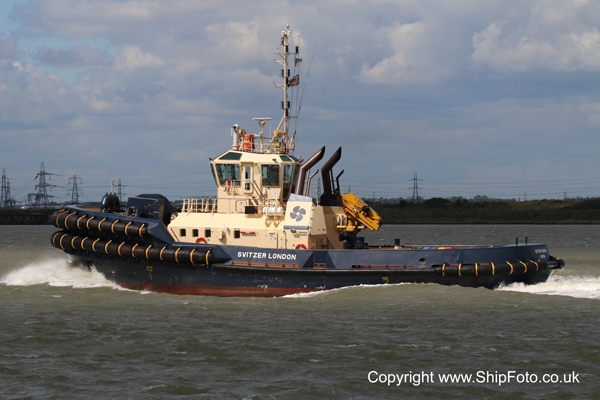 New Svitzer tug SVITZER GANGES moored at London Gateway. 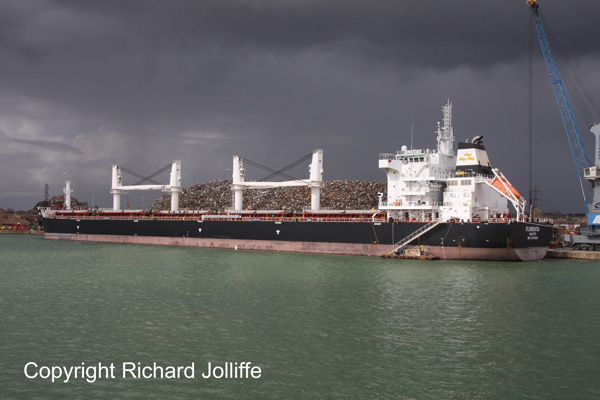 MELCHIOR SCHULTE at Northfleet Hope. 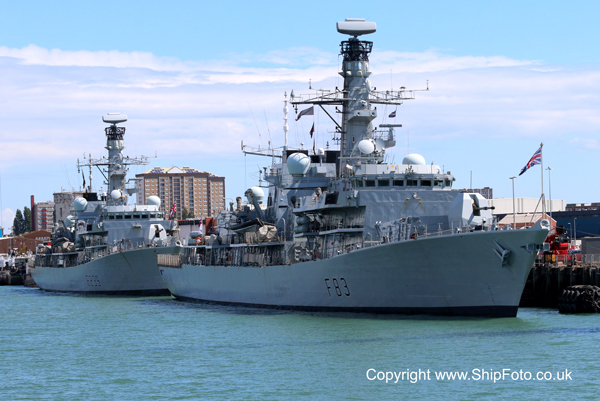 HMS ST ALBANS and HMS RICHMOND at Portsmouth. 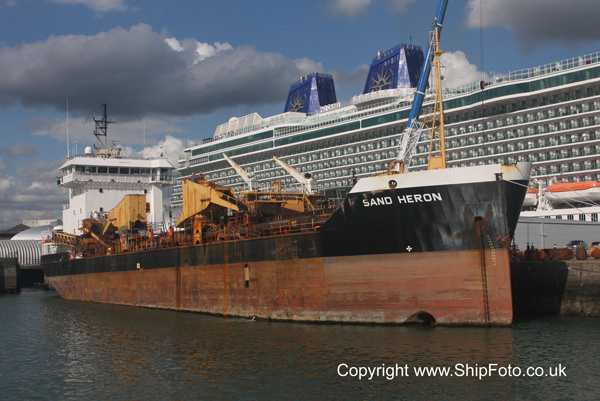 SAND HERON under repair at Southampton. Feeder containership RANGER at the container terminal. 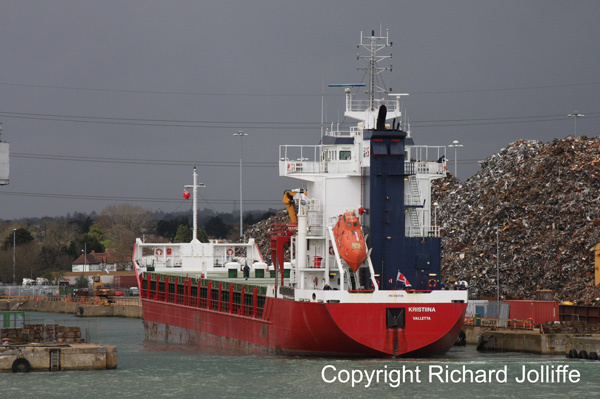 SEA HARMONY arriving with a cargo of scrap. CARIBBEAN PRINCESS departing for St Peter Port. A reasonably sunny day greeted the TSS members assembling for the second Solent Cruise of the 2017 programme. 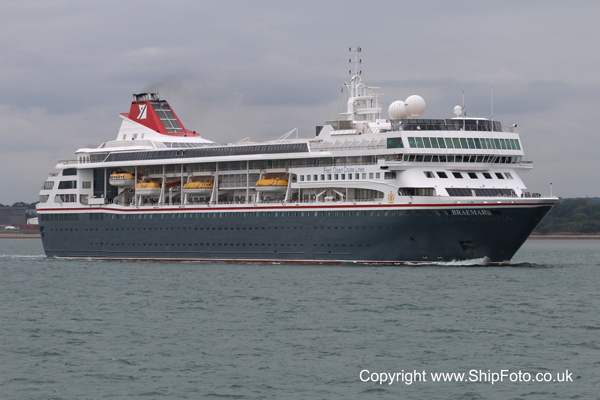 Having departed from Ocean Village at noon on board the Ocean Scene, we decided to go straight to Portsmouth in order to get back to Southampton in plenty of time to see the late afternoon cruise ship departures. Having photographed the ARC vehicle carrier Resolve in the Eastern Docks, we proceeded down Southampton Water, past the inward bound vehicle carrier Autostar. 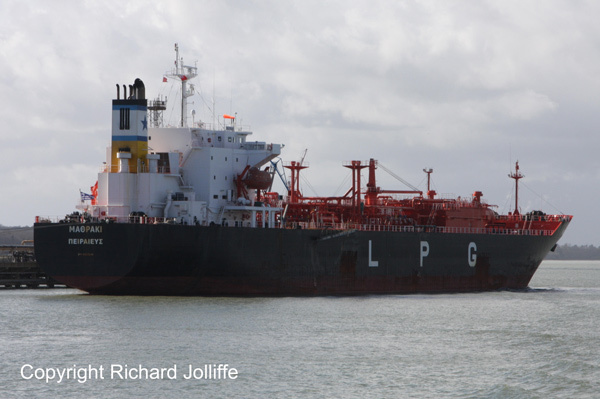 At Fawley Oil Terminal the tankers included the LPG tanker Pazifik as well as a few smaller coastal tankers such as the Solway Fisher. We continued across the Solent, to Portsmouth. Sadly the harbour was a little quiet, most of the Type 45 destroyers were in the enclosed dock under repair and out of view. The Fisher tanker Cumbrian Fisher was in harbour though as well as two frigates HMS Richmond and HMS St Albans. The reefers Crown Topaz and Colombian Star were in the commercial docks. 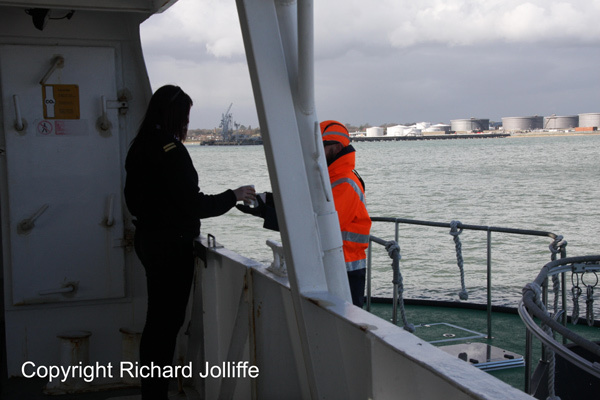 We retraced our steps out of Portsmouth and back across the Solent to Southampton Water. A shower of heavy rain interrupted our photography as we passed Fawley, but by the time we got back to Southampton the sun was out again. A typical British summer! We positioned ourselves just off Hythe for the departure of Fred Olsen’s smart cruise ship Braemar, which was bound for Eidfjord in Norway. We had time to view P&O’s Britannia in Ocean Dock, before the departure of the next cruise ship Navigator of the Seas. Sadly the sun didn’t shine for this one. Then up to the Western Docks where the Normed Antwerpen was loading yachts and the vehicle carrier Blue Ridge Highway was berthed. 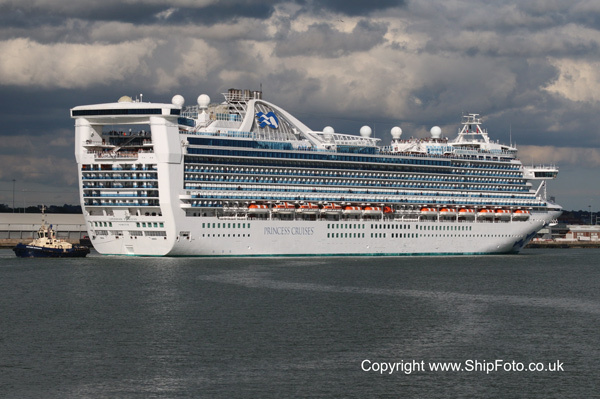 The cruise ship Caribbean Princess was just departing from her berth as we passed her. We proceeded up to the container terminal, where the very large container ship MOL Triumph was berthed as well as the smaller Ever Lissome and feeder Ranger. Having photographed those, we headed back and caught up with the Caribbean Princess which had by this time swung and was departing for St Peter Port. 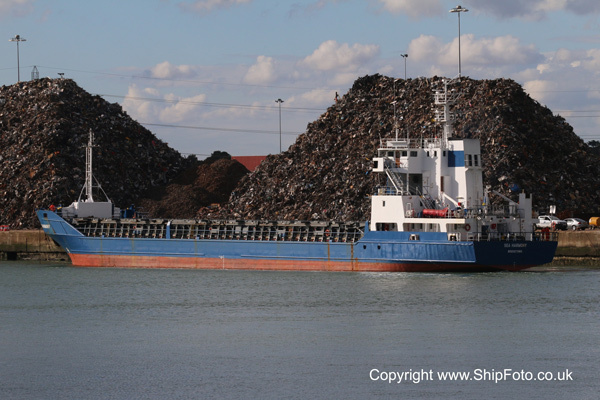 At the same time the small coaster Sea Harmony was arriving with a cargo of scrap to add to the massive pile already on the quayside. By this time it was time for our cruise to draw to a close and we arrived back at Ocean Village just after 6pm. Our thanks as usual go to the captain and crew of the Ocean Scene for looking after us so well and to Ian Cochran and members of the TSS committee for organising the day. Our re-scheduled Thames and Medway cruise took place on 19th August. A sunny morning greeted us as we assembled on the landing stage ready to board the Princess Pocahontas. Once boarded we headed upriver past the MSC Edith and Marfret Marajo at Northfleet Hope container terminal. 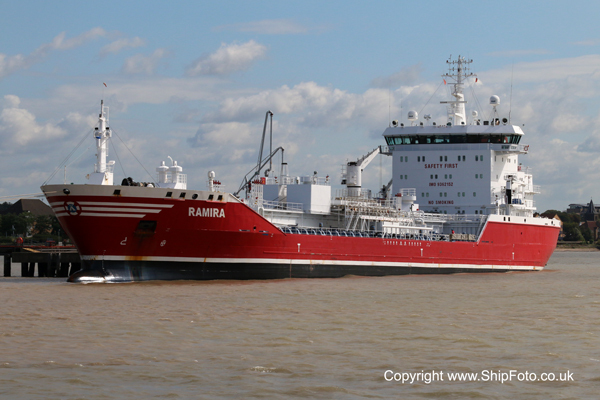 The smart Swedish tanker Ramira was at Grays Terminal. 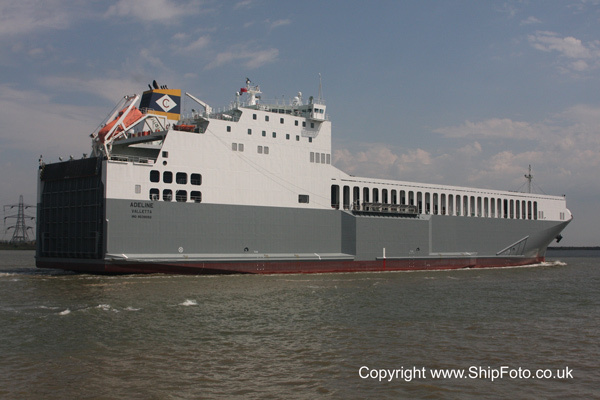 The Sloman Hermes was at the Vopak Jetty with the usual Cobelfret ro-ros at Purfleet. We proceeded upriver further than usual to view three coasters berthed at Erith. The John Friedrich K and Right Step were photographable. We then turned around and proceeded outbound past the GPS tugs moored at Erith. Retracing our steps the Marfret Marajo was getting ready to depart from Northfleet Hope with a tug in attendance. We continued downriver past the tanker Arsland which had been berthed at the disused Tilbury power station jetty since running aground when departing from Jurgens Jetty further upriver earlier in the week. The inbound tug Svitzer London and the container feeder Dina Trader were passed at Ovens. By this time the cloud was increasing. Sadly we could see in the distance the large container ship YM Worth departing from the Gateway Terminal. 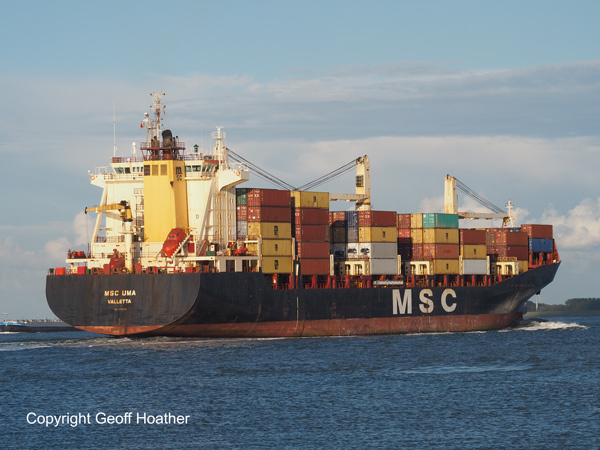 Her place was being taken by the inbound MSC Sofia Celeste. By the time we arrived at the Gateway, the YM Worth was long gone and the MSC Sofia Celeste was being berthed with tugs in attendance. We continued out into the estuary with the Marfret Marajo slowly catching us up. As we turned off into the Medway the Marfret passed us, though at a distance. 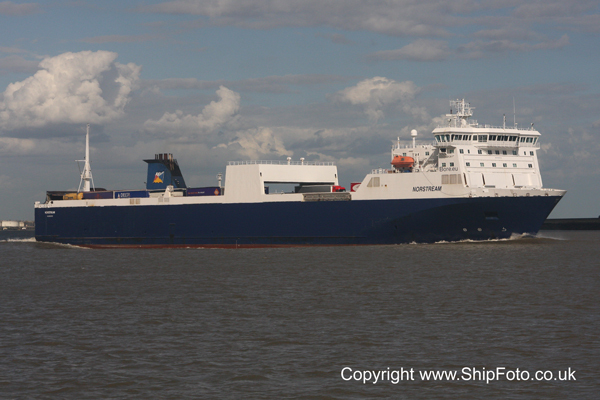 The Medway was a little quiet, with only the cement carrier Cembay and vehicle carrier Makassar Highway at Sheerness. Back now out into Southend Anchorage where the tankers Baltic Champion and Seatrout were anchored. Sadly the sunny conditions earlier had been replaced by cloud with only the occasional sunny period. We then made out way back upriver, past the four tugs, including the new Svitzer Ganges and Svitzer Monarch moored at the Gateway Terminal and closer views of the two container ships Maersk La Paz and MSC Sofia Celeste. As we continued upriver we were caught up by the inbound P&O ro-ro Norstream on her usual service from Zeebrugge and the outbound Cobelfret ro-ro Melusine on her regular service, also to Zeebrugge. We arrived back at Gravesend shortly before 5pm and made our way home. Our thanks go to Captain Potter and the crew of the Princess Pocahontas for their hospitality and to Dave Smith and other committee members for organising the day. SLOMAN HERMES at the Vopak jetty. ... followed by the container feeder DINA TRADER at Ovens. 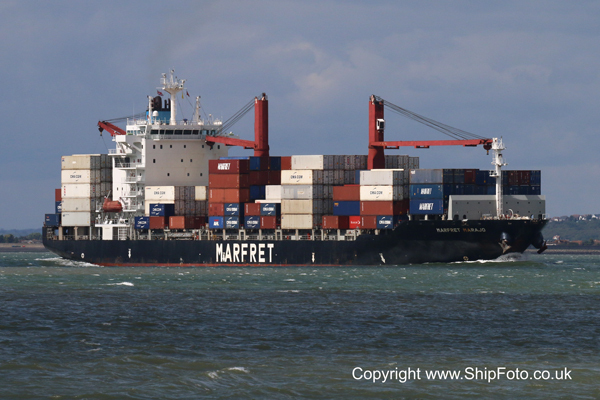 MARFRET MARAJO outbound in the Thames Estuary. Cement carrier CEMBAY at Sheerness. MAERSK LA PAZ at the Gateway Terminal. 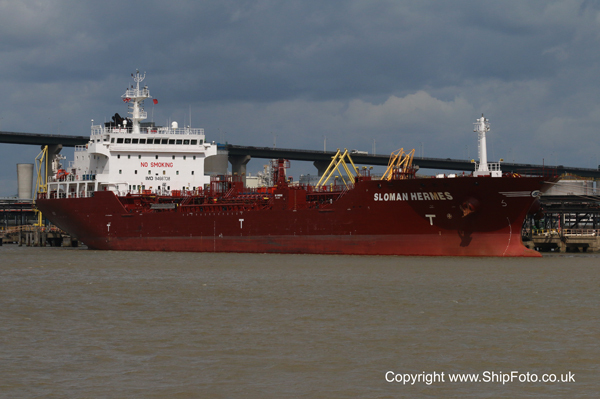 NORSTREAM inbound for Tilbury Dock. NORSTREAM leaving Tilbury Lock for Zeebrugge. NORDIC HANNE at the Vopak Terminal. GRANATO inbound for Grays Terminal. 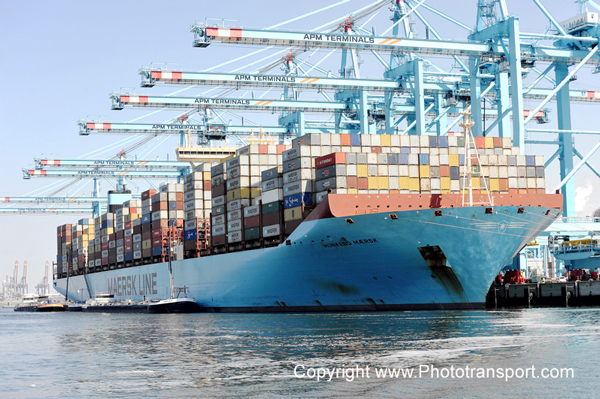 MAERSK LUZ approaching the Gateway Terminal. NEMUNA arriving from Kings Lynn. 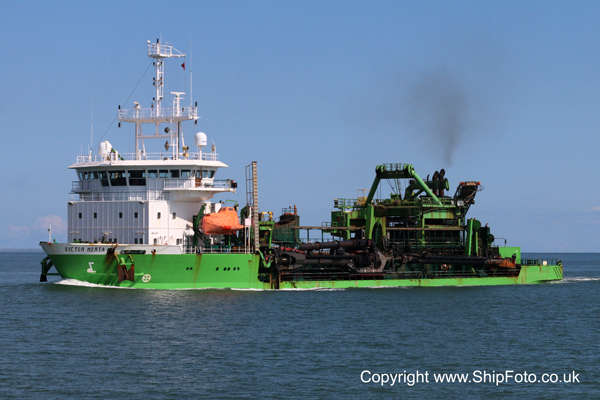 Dredger VICTOR HORTA inbound off Southend. ...followed by the MAXI out from Erith. 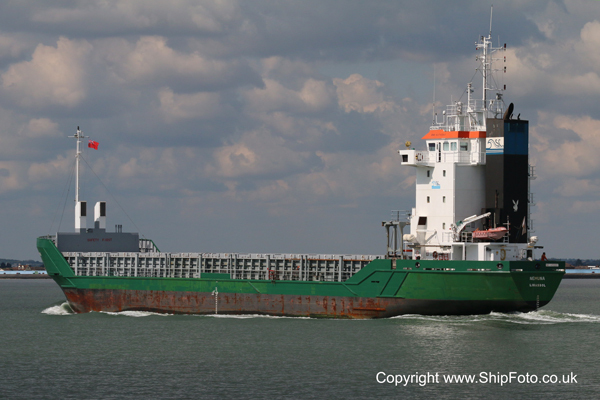 SEA SHANNON passing Denton outbound. Our final cruise on board the Princess Pocahontas for 2017 took place on Saturday 2nd September. The weather was perfect with mainly sunny skies and a flat calm river. We departed at 10am and started by proceeding upriver. 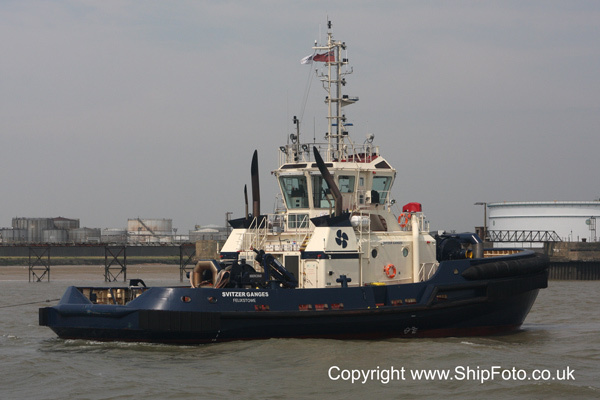 One of the local tugs, Svitzer Madeleine did a short demonstration of her manoeuvrability for us as we cast off. The P&O ro-ro Norstream was just departing Tilbury Lock for Zeebrugge as we passed. Northfleet Hope container terminal was quiet with only the small feeder Ara Atlantis present. 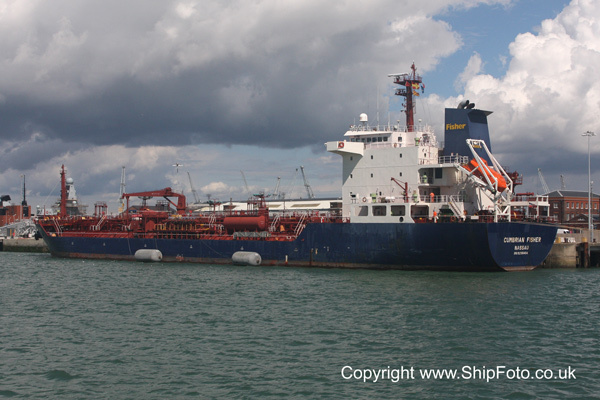 The Vopak terminal was busy with the tankers Sloman Hermes and Nordic Hanne berthed there. Up past the usual Cobelfret vessels berthed at Purfleet as far as Erith where the coasters Frakt Sund and Maxi were working cargo. We turned back downriver at this point, passing the inbound coaster Frisium, bound for Erith. At Bevans Wharf the elderly 1982 built Spanish cement carrier Encofrador was working cargo. We continued downriver meeting the inbound Italian tanker Granato bound for Grays Terminal. 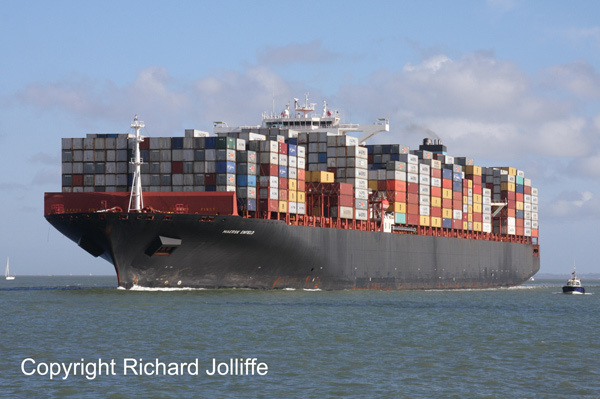 The containership YM Express was at the London Gateway container terminal. 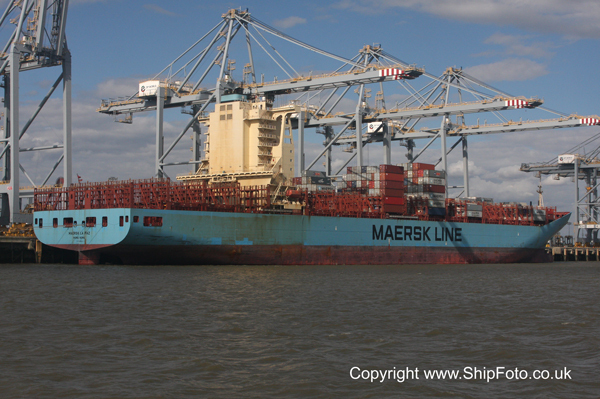 The large containership Maersk Luz was also inbound for London Gateway and we met her off Canvey Island. She was very lightly loaded and made an impressive sight riding high in the water. At this point our ploughman’s lunches were served, but our lunch was interrupted in order to photograph the inbound coaster Nemuna passing for Tilbury Dock. 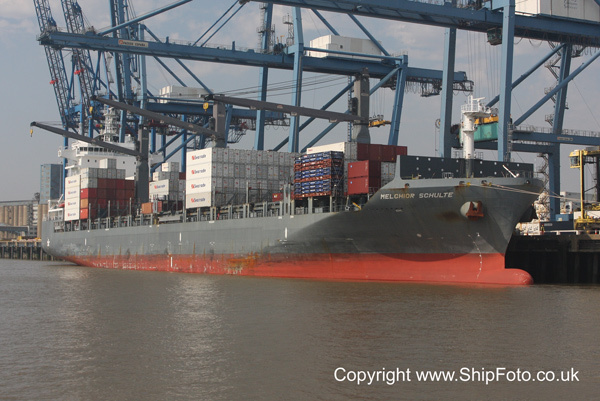 She was followed by the feeder containership Externo arriving from Setubal for Northfleet Hope. Finally, off Southend, the last inbound vessel was the dredger Victor Horta in for Alpha Jetty from the dredging grounds, fully loaded. At this point we turned around and started to make our way back upriver. The previously mentioned Spanish cement carrier Encofrador and the Maxi from Erith were both outbound. Our captain manoeuvred the Princess Pocahontas to a good position to catch both ships passing us in good light. Then up past the London Gateway terminal where both containerships were now working cargo. The Svitzer tugs Svitzer Victory and Svitzer Monarch were also stationed at the Gateway Terminal. At this point we were treated to Scones with jam and cream by our President Paul Mason and Carole Mason which was well received. Further upriver we passed the outbound dredger City of London followed by the coaster Sea Shannon making her way to Ridham Dock from Tower Wharf. Sadly it was time to finish the cruise and we arrived back at Gravesend. Our thanks go to Dave Smith and members of the TSS committee for organising the day and to the captain and crew of the Princess Pocahontas for looking after us so well. We look forward to cruising on the Princess Pocahontas in 2018. 7th to 12th September 2017 - A Schelde Sojourn. Following the success of the last visit to Terneuzen a couple of years ago, 20 members gathered at Doncaster Interchange on Thursday 7th September for the 3pm departure by our hired coach for Hull and the overnight P&O crossing to Zeebrugge. The change of departure point from the previous trip would enable participants to view shipping in the port of Hull and the River Humber. Our enthusiastic driver, Paul, soon got the gist of what we were all about and, prompted by our tour leader Simon Lee, on the way to Hull took us for a quick check out of the port of Goole, where we recorded the first few vessels of the trip, including the veteran Swedish cement carrier Vastanvik. Our ferry for the crossing was Pride of Bruges and we were soon checked in and on board. Departure was at 18.30 but before that most of us were up on deck checking out the shipping in Hull's King George Dock and also several vessels arriving in the Humber. 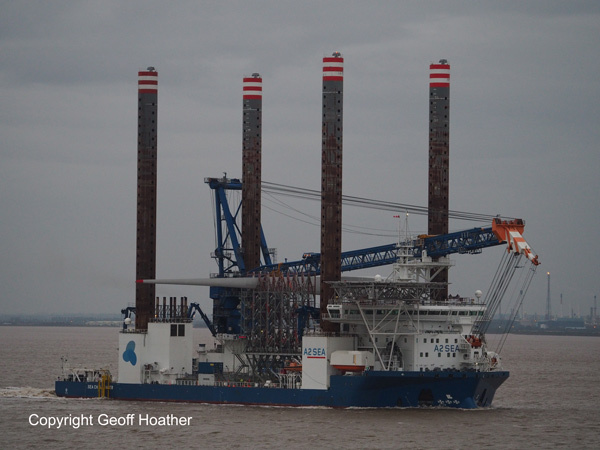 The latter included the unwieldy-looking jack-up, offshore support vessel Sea Challenger. We had to wait in the lock until she had passed by and, unfortunately, this meant that it was just about dark by the time we passed the busy riverside berths at Immingham. Our arrival the next morning in Zeebrugge was greeted by overcast and rainy conditions, which sadly persisted the whole day. However, this didn't prevent us following the planned itinerary. First a look around the port of Zeebrugge where we were able to photograph a number of vessels, including the large cruise ship MSC Preziosa, the geared containership Catharina Schulte locking in, and the appropriately-named, new lng-powered car carrier Auto Eco. Next a quick look in at the inland port of Bruges but no coasters on view this time unfortunately. And so, off to our destination, Terneuzen, via the Ghent Canal. The latter produced about a dozen ships and a brief stop part way along at Sluiskil gave us the opportunity for some photos. 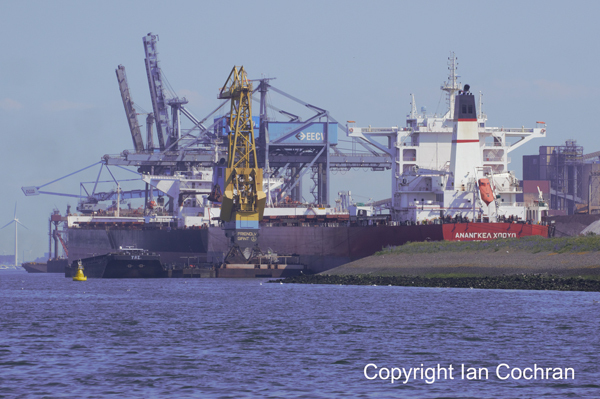 After arrival and check-in at the excellent Golden Tulip hotel, the remainder of the afternoon was spent relaxing after the journey and braving the weather to record and photograph the shipping arriving and leaving on the busy River Schelde. The next day, Saturday 9th, was designated a free day, not least to give our excellent, very co-operative driver a rest. We awoke to yet more grey sky and heavy rain showers but this didn't dampen our enthusiasm and, after breakfast, most of us were soon out on the observation spots on the banks of the river. As the day went on the weather brightened up, apart from one almighty downpour around lunchtime, which caused several of us to decamp to the excellent riverside bar/restaurant opposite the hotel and still affording good views of passing shipping. I recorded approaching 50 ships that day, virtually all eminently photographable. Highlight vessel for me was the Chinese-owned, Singapore-flagged cargo ship Han Zhi with her heavy lift cranes, but others might choose one of the large containerships such as Theseus or APL Raffles. The following day, Sunday, the plan was to take the coach to Antwerp and drive around the port using the Port Authority recommended viewing points. A handful of members though decided to stay by the river in Terneuzen once again. The rest of us had an excellent day visiting first of all the scrap yard in Ghent, primarily to see the French landing ship ORAGE (L9022) before she is reduced to razor blades. We drove via the road which runs close to the Ghent Canal again, stopping here and there for photos. Then onward to Antwerp where we were able to find a number of convenient photography stops within both the old and new dock areas. Vessels ranged from coasters and car carriers to tankers and bulkers and large container ships. On our return we stopped briefly at the small port of Hansweert on the River Schelde. Arrival back at Terneuzen was late afternoon and gave time to capture more arrivals and sailings on the river before darkness stopped play for the evening. Vessels ranged from the crude oil tanker Los Angeles Spirit and the wonderfully named gas tanker Happy Pelican to the large mid/aft containership Maersk Edmonton and the bulker AM Annaba; the latter arriving to anchor mid-river to offload some of her cargo into barges before entering the Ghent Canal to complete discharge. Monday 11th was our last full day and after check out from the hotel we headed first to the docks at Flushing on the opposite bank of the river via the 6.5 kilometre long Westerschelde tunnel. Unfortunately the Port Authority had not given us permission for a guided tour but there are various vantage points around the dock area where photos can be taken of some of the shipping. Also there is a good spot overlooking the River Schelde and we were lucky to catch the inbound containership MSC Francesca which made for some excellent shots. From Flushing we headed off to Europoort as our return ferry crossing was from there rather than Zeebrugge; this would give the opportunity of a few hours by the New Waterway behind the Maasvlakte complex before catching the 20.30 P&O sailing to Hull. By now the weather had decided to remind us of our first day - grey skies and intermittent rain! After a lunch stop at the small port of Stellendam, where there is a shipyard which builds tugs and trawlers and a repair facility, we headed on northward to Europoort in worsening rain and wind. By the time we got there and parked up at a vantage point by the New Waterway to await the passing shipping the weather had improved a little to showers and even some sun. 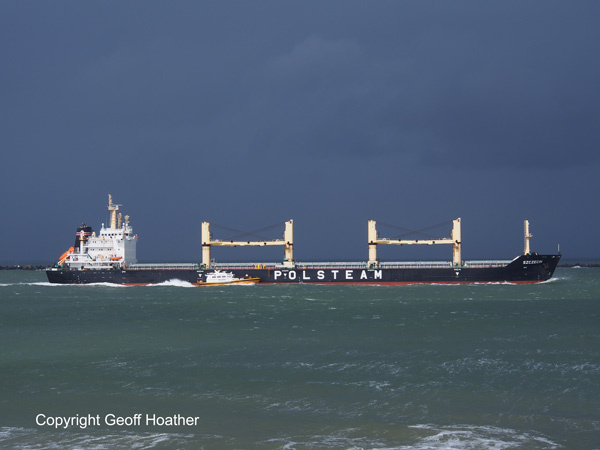 Probably the highlight of the vessels passing by was the geared Polsteam bulker Szczecin, which arrived bathed in a pool of sunlight but with a backdrop of angry black clouds and making for an impressive few shots. Making the short run back round the Maasvlakte complex, and managing to note some of the containerships and photograph the ungainly-looking, semi-submersible, heavy-lift vessel Dockwise Vanguard, we arrived at the ferry dock and boarded Pride Of Hull for her overnight crossing. There was still enough light to go up on deck and grab a few last minute photos of the half a dozen ships moored nearby, including several quite large bulkers, before it was time to retire below for food and drink and a well-earned rest after a full day. Arrival back in Hull was at 7am but not before a few of us went up on deck at first light to catch the vessels on the berths at Immingham - a final half a dozen for the tally. All in all an interesting and successful trip with about 250 ships recorded (excluding local tugs and harbour craft) and some great photographic opportunities. Thanks go, in particular, to Simon Lee for leading the trip and to Paul, our driver, for his patience and dedication and his new-found enthusiasm for our hobby. He even suggested he might join the Society. Jack up vessel SEA CHALLENGER arrives in the Humber on the evening of our departure. Cruise ship MSC PREZIOSA at Zeebrugge. 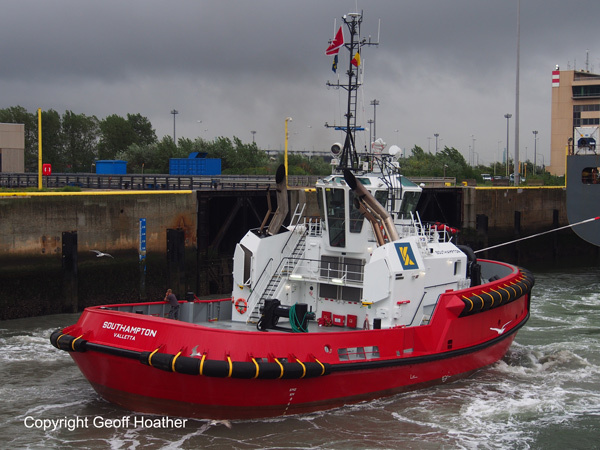 New tug SOUTHAMPTON assisting at the locks in Zeebrugge. 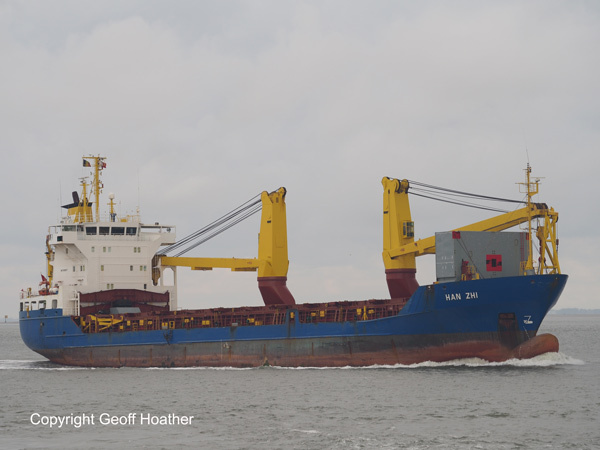 HAN ZHI inward bound on the Schelde for Antwerp on Saturday morning. 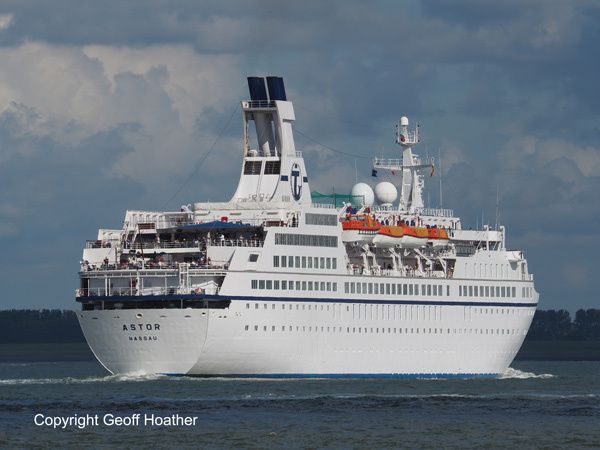 Cruise ship ASTOR arrives on the Schelde for Antwerp in Saturday afternoon sunshine. Geared containership MSC UMA inbound on Saturday evening. 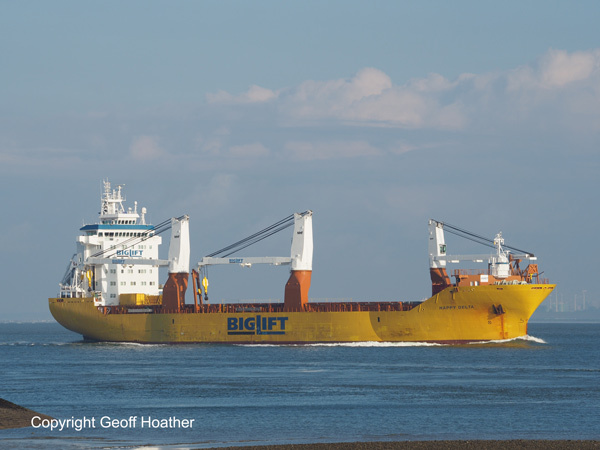 Heavy lift ship HAPPY DELTA captured inbound on Sunday morning before our departure for Antwerp. Geared bulker CS JADEN seen at Antwerp on Sunday. 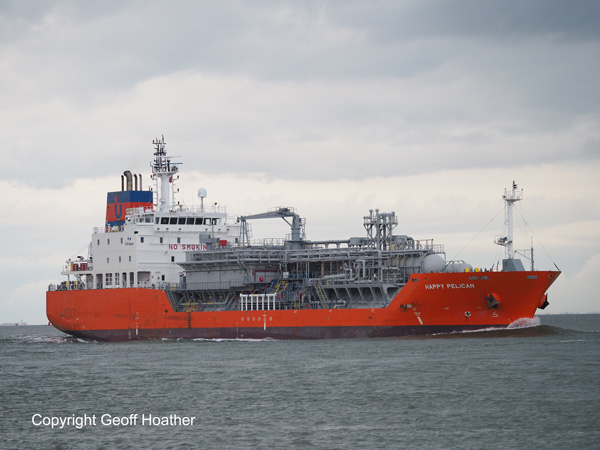 Gas tanker HAPPY PELICAN hurries inward on the Schelde following our return from Antwerp on Sunday. 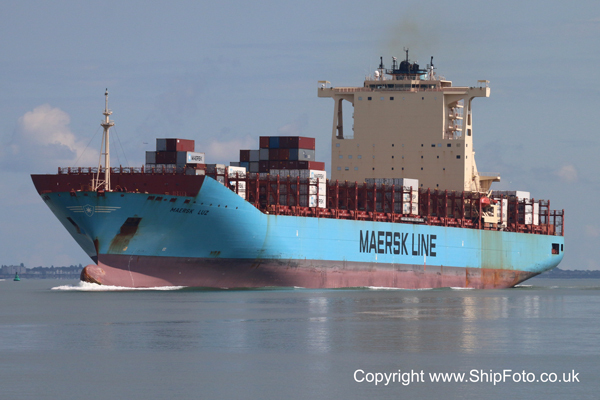 Mid and aft containership MAERSK EDMONTON arrives on Sunday evening. Bright sun, black clouds! 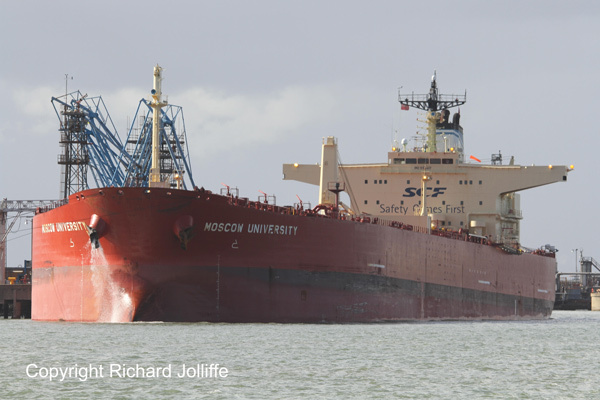 Bulker SZCZECIN takes the New Waterway pilot on Monday afternoon. Photos and report by Geoff Hoather. Copyright © Thames Ship Society 2004-2017 : All photographs on this website are copyright of the copyright holder as indicated for each photograph. Photographs may not be re-produced in any way without prior permission in writing from the TSS. Whilst we try to ensure that all information contained on the website is free from error, the TSS and it's members cannot be held responsible in any way for the validity of the website content. Send mail to ThamesShipSociety with questions or comments about this web site.